DO indulge in a small cake cone or sugar cone. Just as the too-large cones are dangerous because they can hold too much ice cream, small cones are fantastic because they can only hold so much! Plus, the calorie counts are nice and low. Cake cones, the flat-bottomed ones, generally have 20 - 25 calories, and standard sugar cones have 45 - 60 calories a pop. DO scope out alternative options. Yes, you're at an ice cream shop, but there may be other treats worth considering! Soft-serve fro yo? Go for it. Sorbet? Sweet! Just check the nutritional stats to make sure your choice is a good bet. DON'T get crazy with the toppings. Those things can get you into TROUBLE. Just because you got a scoop of super-light ice cream, that doesn't mean that piling on candy, cookies, and gooey syrups won't affect the stats in a big way. Fresh fruit toppings, however, are always a good choice! DO gather ideas for later. Sure, that hot-fudge brownie sundae on the menu may be a calorie catastrophe, but that doesn't mean you can't re-create it at home... guilt-free, of course! 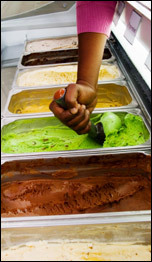 Mini Survival Guides for Mega-Popular Ice Cream Chains! Best Options: The magic words? BRight Choices! There's Fat-Free Vanilla Frozen Yogurt, Caramel Turtle Truffle Reduced-Fat No Sugar Added Ice Cream, and Pineapple Coconut Reduced-Fat No Sugar Added Ice Cream. A small order has only 80 - 120 calories. 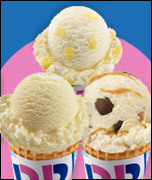 And don't discount the Kids Vanilla Soft Serve Cone -- only 130 calories and 4.5g fat! Shocker: Chocolate Chip Cookie Dough Sundae -- sharing this with a friend or two does NOT make it an okay selection. It has 990 calories, 43g fat, and over a HUNDRED grams of sugar! Best Options: The lightest options are the no-sugar-added vanilla ice cream, fat-free vanilla frozen yogurt, orange sherbet, and (how good does this sound?) watermelon sherbet. Each of these has 160 - 170 calories per scoop. Shocker: While the 5-scoop Super Sundae and 12-scoop Giant Crowd Pleaser are clearly nutritional nightmares, the item that REALLY haunts our dreams? The Hunka Chunka PB Fudge Lava Cake Sundae, with 1,140 calories and 70g fat. Even if you share it with three friends, that's still 440+ calories and more than 25g fat. ACK. Best Options: Here we HIGHLY recommend the Vanilla Greek frozen yogurt, which has 150 calories and 4g fat per half-cup scoop. 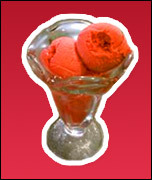 Also great are the sorbets, with 110 calories or less per half-cup scoop. 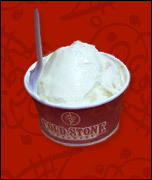 Best Options: The Sinless ice cream -- Cake Batter, Banana, and Sans Fat Sweet Cream. Each "Like it" serving has 170 - 210 calories and 0 - 1g fat. There's also a fantastic array of fat-free sorbet selections (Pink Lemonade, Watermelon... Strawberry Mango Banana!) with 140 - 240 calories per "Like it" serving. Cold Stone also has a BUNCH of fro-yo flavors with impressive stats. Shocker: If you order a "Like it" portion of regular Cake Batter ice cream with a mix-in of brownies and pecan pralines, that li'l cup will contain about 710 calories and 46g fat!!! We're not saying that's the worst thing you can order -- we're saying that it's easy to get into trouble, even with the small servings. And click here for our Fro Yo Survival Guide! 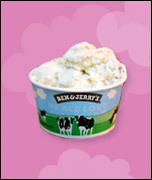 Quick, before your pals head out for ice cream -- click "Send to a Friend" now! It's National S'mores Day, August 10th! Keeping with the theme of today's email, try this Gimme S'more Sundae!